Tampico’s sidewalks probably have not encountered so much foot-traffic in decades. By 9:00 a.m., a crowd was gathering. Some came inside the Birthplace, others waited outside to take pictures of his arrival. The game plan was that he would start out at a breakfast and tour of the Reagan Museum at Eureka College, and then he would board a bus with an entourage of 50 people, which included the president of Eureka College, Dr. J. David Arnold and head out for Tampico. By 9:30 a.m., everyone was at the ready for the scheduled arrival of the son of the favorite son. A welcoming committee chose their positions inside the Birthplace Gift Shop. EMT’s doing double-duty as cashiers waited behind the counter. The Mayor & Mrs. Specht prepared to meet the other dignitaries and Mr. Reagan. Members of Tampico’s “Royalty” stood at the door-step of the Gift Shop to greet Mr. Reagan on his arrival. A few doors down at the Historical Museum, was a similar scenario. Coffee was perking and the punch bowl filled. Napkins and service-ware decoratively displayed so that the anticipated crowd would flow unobstructed through the Museum. The TAHS has sponsored a Ronald Reagan Birthday Party since his election, but this year was extra special. The cake, designed and prepared by Mrs. Tabor of Tampico, was displayed on a table of its own. 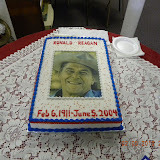 This year’s cake picture was of Ronald Reagan in his “Ranch attire.” A point that his son would later expound on, impressing and reminding us all how his dad never forgot his roots, nor did he ever really leave them. He started out with a simple life and Michael felt that simplistic life-style of living was carried on at his ranch home in California and in his life. The ranch was modest by California standards. Michael reiterated that his dad never presented himself in an ostentatious manner that said, “Look at me, I’m the president.” He still chopped the wood for the fireplace himself. Michael said the Birthplace apartment felt the same as the ranch. Many are familiar with Ronald’s small town boy upbringing, but I also know he was very well cared for by many. I met so many folks that day that told of how their aunt, grandmother, mother, or some other relative use to babysit for Ronnie. Ironically, I did not meet one person that was related to one of the 75 people he saved in the canal. However, I did talk with Lucille Rice whose uncle, Fred Beggs, swam in the canal near Nim’s Park with him. Mr. Reagan seemed very attentive as Joan Johnson gave him the tour, starting with the many photographs and news articles displayed through the room and then in to the adjoining bank. He quipped anecdotal stories that he remembered his dad telling him of the various places or people he saw in the photographs. The First National Bank has been restored to its original appearance. Joan showed Michael an old bank ledger showing a December, 1919 entry for Mrs. J. T. Reagan, with $95 on deposit. There were several memorable moments during his visit. My favorite was his meeting Amy McElhiney. Another moment was the look on Mr. Reagan’s face when he first walked into the apartment and again into his dad’s bedroom. Watching him climb through the window that his dad was passed through as an infant was endearing as well. The ceremonial cutting of the cake, followed by him taking the first bite and giving his opinion was also one of those Kodak moments. After the cake-cutting ceremony, he was presented with a gift basket from Mayor Specht. Michael finished his visit in Tampico telling the audience of his Liberty Education Tours, where he is taking US students over to the Czech Republic, showing them the thousands of bunkers & remains of the Iron Curtain. John Morris, director of the Reagan Museum also spoke briefly to the crowd. It was they who sponsored the tour for Mr. Reagan. The last speaker of the day was Dr. J. David Arnold, president of Eureka College, reminding everyone that may be sending a child to college, to remember the humble beginnings of a man who became president, and where he went to college. It was an honor to have Mr. Reagan in Tampico. Approximately 250 people attended the event from MO, IA, CA, WI, FL and IL. I think that Tampico offered as much to Michael as he did to the town. It’s one thing to talk about humble beginnings or even look at photos, but to actually see the apartment where his dad lived, talk to the people, see the town, learn of the history of the area is quite another thing. He came to give us a message of hope and to inspire us and to remind us of what his father stood for. He left with a new understanding and a much better appreciation of what his words truly meant.